Back in '76 this Reggie twofer was considered a downer, and amid the rise of punk, Bruce, Patti and the like, Blue Moves was viewed as downright irrelevant. 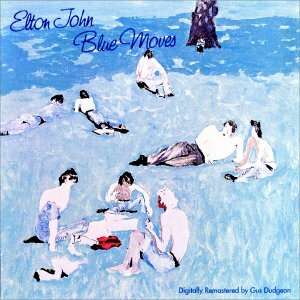 However time has proven this to be among Elton's masterworks - and most enduring slab. To my ears, John's second great ensemble - with bassist Kenny Passarelli, Roger Pope, Ray Cooper, Caleb Quaye, James Newton-Howard, and Davey Johnstone (and cameos by the Brecker Bros., Crosby & Nash, Bruce Johnston, the LSO, David Sanborn) - pushed their bandleader to his utmost musical heights with their remarkable collaborative jazz, funk, classical, and rhythm & blues pedigree. Kenny is on fire on every track, especially "Out of the Blue," "One Horse Town," "Boogie Pilgrim," "You Started For," "Crazy Water," "Bite Your Lip," "Chameleon" and "Shoulder Holster" to cite a few - playing the pocket and plying harmonic extensions with deft precision and a perfect round tone. Flawless interplay, impeccable arrangements, terrific compositions; a bona fide classic.